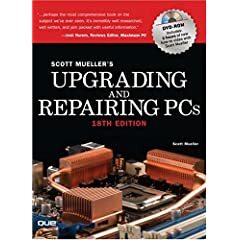 My #1 most popular book (and the best-selling PC hardware book world-wide) is Upgrading and Repairing PCs, currently available in a new 20th Edition that includes an all-new DVD with nearly 2 hours of video training. 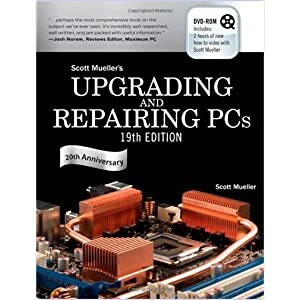 Upgrading and Repairing PCs 20th Edition is available as a book/DVD combo as well as in stand-alone PDF or EPUB "eBook" files. For over 20 years, Upgrading and Repairing PCs has been the industry's #1 guide to PC hardware: the single source for reliable, step-by-step information on identifying and fixing problems, adding hardware, optimizing performance, and building new PCs from scratch. The 20th Edition has been completely updated to focus on today's technologies and today's maintenance challenges. From processors and motherboards, memory to storage, video to power, and networking to Internet connectivity, it's all here: technical details, practical insights, and step-by-step solutions to difficult problems. Updates include new CPUs, solid state drives (SSDs), hard disk drives, form factors, chipsets, power supplies, memory and a whole lot more. The 20th edition represents a significant rewrite, with new material added and old material consolidated. In addition, based on reader feedback the new 20th edition changes back to a hard cover binding that had been a staple of the book for so many years. Master every topic on both new 2012 A+ exams. Start-to-finish A+ preparation from the world's #1 PC hardware expert, Scott Mueller! 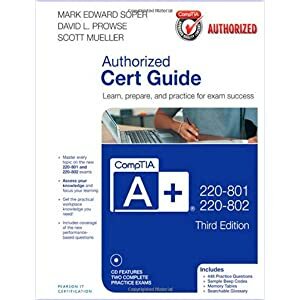 This book and DVD is ideal for anybody who needs to pass the new 2012 version of the A+ test. My "Build a PC" DVD features two hours of personal instruction on buildiing your own PC from scratch. I show you how to choose the right hardware and put it all together. Perfect for beginners, I take you under the hood to show you exactly how to build a PC right, the first time. Not only is this designed to enable a novice to properly spec. out and build a system from scratch, but it also contains numerous tips, tricks and information for experienced builders as well. For example, one of the segments shows how to deal with FPIO (Front Panel Input/Output) connections that trouble even more advanced builders. Includes a companion booklet. Laptops have become more popular than desktop systems in many markets. 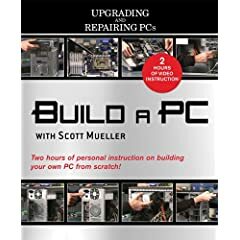 Have you ever wanted a book like Upgrading and Repairing PCs, but written specifically to cover laptop and notebook computers? Upgrading and Repairing Laptops is the most in-depth hardware book covering laptops, notebooks and other portable PCs. 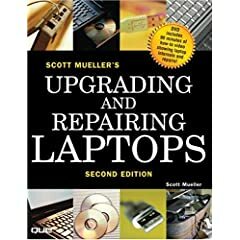 Upgrading and Repairing Laptops, 2nd Edition includes a unique DVD covering laptop hardware. I had many requests to do a Windows book with the same "nuts and bolts" feel as well as the comprehensive and detailed coverage as my other Upgrading and Repairing Books. 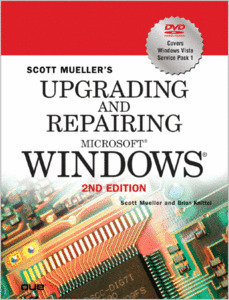 Upgrading and Repairing Windows was the result, and it is currently out in a new 2nd Edition. Upgrading and Repairing Windows covers all versions of Windows, emphasizing Windows XP and Vista in detail. Upgrading and Repairing Windows is available as a book/DVD combo as well as a stand-alone PDF "eBook" file. The DVD included with the book covers both Windows Vista and Windows XP. Topics include the differences between all of the various Windows editions and versions, coverage of the most important improvements in Vista, and reasons why you might even want to stay with XP instead. Also covered are Vista and XP installation tips and tricks, updating Windows, dealing with product activation, and more. Note: The appendices (bonus elements) for Upgrading and Repairing Windows, 2nd Edition are available by clicking on the Downloads tab in the first InformIT Link above. Upgrading and Repairing Servers includes a DVD showing how to build an inexpensive yet high performance entry-level pedestal or rack mount server from scratch, as well as presentations on the components used to build a server including RAID controllers and drive arrays. 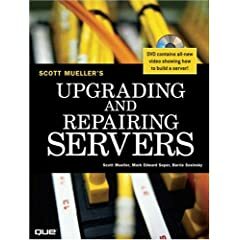 Upgrading and Repairing Servers is available as a book/DVD combo as well as a stand-alone PDF "eBook" file. 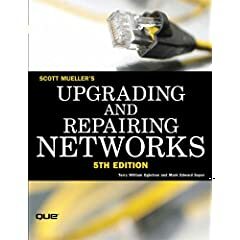 Upgrading and Repairing Networks is the most comprehensive, detailed, and yet easy to read book on PC networking, currently available in a 5th Edition. Upgrading and Repairing Networks covers all aspects of networking PCs, from hardware to software, including wireless networking technologies. Upgrading and Repairing Networks is available as a book/DVD combo as well as a stand-alone PDF "eBook" file. Because the DVDs that come with my books are unique and not normally sold separately, many people purchase older editions of my books just to get the unique DVDs! If you are interested in more video training, there are several previous book/DVD combos still available, along with a few other unique video products. The 18th Edition book/DVD combo includes a 2-hour DVD with detailed information on SOHO (Small Office Home Office) networking including routers, switches, network interface cards (NICs), wireless networking, cable/DSL modems, security, setup and more. The 2-hour DVD included with the 17th Edition hardcover book contains segments on dual-core processors, motherboards, chassis, power supplies, memory and more. It is designed to build upon the 3.5-hour dual-layer DVD previously included with my 16th Edition book, one of the most comprehensive and popular training DVDs I've ever made. The 16th Edition DVD features video segments with detailed instructions for building a complete PC from scratch, including installing the OS and drivers. One of the segments goes into extensive detail on the characteristics for good chassis design and cooling. You might find it interesting to know that both the 16th and 17th Edition DVDs were captured, edited, and mastered on the very same system you see me build in the 16th Edition video. Previously the only way to get the 16th Edition DVD was to order the complete 16th Edition book/DVD combo, however the 16th Edition DVD was so comprehensive and well-received that you can now get it as a stand-alone product available for under $10. 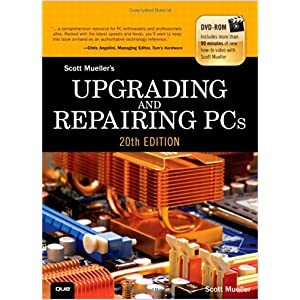 The first Editions of Upgrading and Repairing Laptops and Upgrading and Repairing Windows are also still available, and each includes unique DVDs that are different from the newer editions. Note: I have excess inventory of MOST of my books (both new and old), which I can offer to my loyal readers and forum subscribers at heavily discounted prices. I sign these copies, including a personal note or dedication at your request. If you are interested please see this post for more information, or send a message to forum@scottmueller.com. Thanks for your interest, Scott. Last bumped by Scott on Thu Dec 24, 2009 10:29 am.